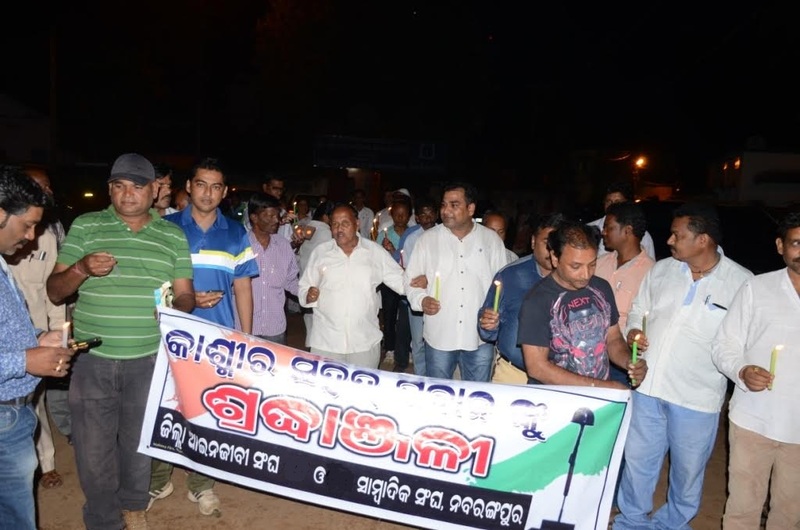 Nabarangpur-Online: Candle march to pay homage to martyrs at Nabarangpur. Candle march to pay homage to martyrs at Nabarangpur. A candle march was organized by District Bar association with local Journalist's to pay homage to 18 soldiers of Indian Army who were brutally killed by terrorists in Uri in Jammu and Kashmir. The march started from sub-collector's office to Gandhi chowk passed through National Highway-26. Near the Gandhi statue observed two-minute silence to pray for the bravehearts who sacrificed their lives in service of the nation. The delegates of Prajapita Brahma Kumaris, district Amala Sangha participated in the march.